The snow is melting, the sun is shining and everything in the garden is starting to take root again. Lots of chores popping up in the garden along with all those weeds. Here’s a cool “Personal Tractor” to help you get around the homestead and garden with less back, neck and knee pain. 1. Durability: Built with a wide stance to prevent tipping these mini off road scooters will keep you comfortably in your seat. Large knobby tires take you anywhere and the powder coated paint job will keep it performing year after year with solid protection from the elements. 2. Cool Features: a 360 degree swivel seat lets you reach those weeds and plants in comfort, without the lower back and neck pain. Adjustable handle and storage for hauling all the necessary gear, plants and fertilizer with you. Don’t give up on your garden because you’re another year older. Don’t pay the neighbor kid to do it – you love gardening way too much. 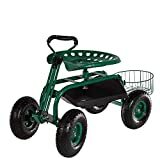 This little garden cart will help you get the job done this season. It’s a small investment that will have huge dividends in the form of less pain and a beautiful garden. Enjoy!